The Book was presented to Phillip Jensen at the launch at Moore College of Two Ways Ministries on May 30 2015. 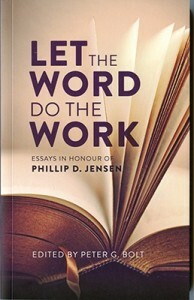 “When Phillip Jensen announced his resignation from St. Andrew’s Cathedral, Sydney, the Directors of the Australian Church Record immediately requested me to commission a volume of essays in his honour. It is no exaggeration to say that Phillip, with his focus on clear Bible teaching and gospel proclamation, has been an enormous influence in maintaining and shaping Sydney’s evangelicalism. It is equally clear that his ministry has influenced good, evangelical change throughout Australia and in significant places across the globe. Of course, the thanks and praise must go to the Lord Jesus Christ, who called Phillip to himself in order to thrust him out as yet another labourer into his harvest field. But because his ministry has brought so many benefits to so many people and also to the evangelical cause, it would be an act of ingratitude to Christ if we did not also thank Phillip himself for his faithfulness to the Saviour. Rejoicing in the Lord’s work, and in the work of his servants ought to go hand in hand. Peter Blowes, Peter Bolt, D.A. Carson, Chris and Mona Chia, Richard Chin, Paul House, R. Kent Hughes, Matthew D. Jensen, Peter Jensen, Paul and Sandra King, Simon Manchester, Colin Marshall, Joshua Ng, Tony Payne, Carmelina Read, Rob Smith, William Taylor, Mark Thompson, Tim Thorburn, and Jane Tooher. Let the Word do the Work is distributed by Matthias Media.